of customers across different industries: from governmental, military and educational institutions to communication, construction companies, IT consulting firms, financial institutions, investors and other businesses from all over the globe. Lion Global Investors, one of the largest asset management companies in Southeast Asia, was looking for a solution to prevent a large storage of important Microsoft Outlook data, built up over the years. The technicians of the company approached our team with a request of a custom Microsoft Outlook backup solution that can offer additional functionalities to their specific needs. Lion Global Investors, Inc. - one of the largest asset management companies in Southeast Asia, offering a comprehensive suite of investment products in Asian market, on behalf of institutional and retail client base. Auto-activation of multiple Safe PST Backup licenses. The custom configuration file, based on Safe PST Backup software has been successfully developed, including all requested features: silent auto-installation and auto-activation of the software, PST files backup to the specified location and a scheduled backup at specified time intervals. 4Team specialists provided quick assistance and a guide to deploy more than hundreds of Safe PST Backup Enterprise licenses on their office machines. After the testing period of Safe PST Backup, our team received Nato Defense College (NDC) request to prepare a customized Safe PST Backup configuration file that has an additional feature - Microsoft Outlook data backup scheduling, based on a filename pattern. Nato Defense College (NDC) is an international military college for NATO (North Atlantic Treaty Organization), located in Rome, Italy. The College is training and educating military and civilian leaders to work at NATO Headquarters and its Commands, as well as, in the related diplomatic and military fields. Key challenge:To provide a customized Microsoft Outlook data backup solution suitable for a mass deployment on hundreds of workstations with an additional functionality - Microsoft Outlook data backup scheduling, based on the filename pattern. The customer received .msi file of the latest Safe PST Backup Enterprise version for mass deployment on hundreds of their office workstations. The requested features were successfully implemented that turned off the welcome message and uninstall redirection to the web questionnaire, and provided Microsoft Outlook data backup scheduling, based on the filename pattern. Warner Bros. Interactive - a worldwide publisher, developer, licensor and distributor of video games requested for a customized Microsoft Outlook backup solution with PST file splitting feature. The additional configuration is needed to avoid long backup performance due to the oversized Microsoft Outlook data files. Warner Bros. Interactive - an American video game development and publishing company that is a division of Warner Bros. Home Entertainment Group. The company has published numerous video games (for both internal and third party titles), including the ones, based on Warner Bros films and animations. Key challenge: To provide Microsoft Outlook backup solution based on Safe PST Backup software that has PST file splitting feature. The customized Safe PST Backup .msi file was built by 4Team developers that offers the PST file splitting feature, in case the PST file size limit is reached. It allows System Administrator to back up large Outlook PST files much easier when splitting into smaller ones. The silent Safe PST Backup auto-installation and auto-backup were provided as well, so that software actions would not interfere with the users’ work. Insight - one of the leading providers of IT products and services requested for a customized backup solution that includes auto-backup of Microsoft Outlook data on all users’ workstations and an additional PST file scan feature. Insight - a global provider of information technology (IT) hardware, software and service solutions to business and government clients worldwide. Insight is focused on helping organizations to move technology goals forward. With more than 5000 teammates across the globe, the company operates in 21 countries. 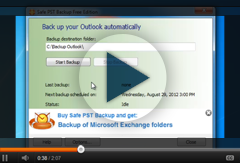 Key challenge: To provide a customized Safe PST Backup backup solution that includes auto-backup of Microsoft Outlook data on all users’ workstations and the PST file scan. The configuration file of Safe PST Backup tool has been successfully adjusted to all requested features. Additional licenses of Administration Tool were provided for convenient monitoring and tracking of the backup process from one location. Geodis Wilson - a leading global freight management company picked Safe PST Backup software to back up and preserve vital Microsoft Outlook data on hundreds of workstations in their office. The only matter was to prepare a configuration file according to their specific needs for mass deployment on company's network. Geodis Wilsonis a leading global freight management company. With 7,700 employees in the global network of more than 50 countries, the company serves their customers with tailor-made, integrated supply chain solutions that deliver cargo by sea and air. Key challenge: To prepare Safe PST Backup package for software mass deployment on hundreds of the company’s workstations. More than a hundred licenses of Safe PST Backup Enterprise were provided together with the Administration tool. Additionally, minor customization has been done to provide a remote installation (LAN) of Safe PST Backup across multiple office workstations. Balfour Beatty - a leading international infrastructure group needed a reliable solution to back up Microsoft Outlook data during the migration to a new Exchange server. And an additional feature is requested to allow software activation in offline mode (without internet connection). Balfour Beatty - a leading international infrastructure group that delivers services essential to the development, creation and care of infrastructure assets: roads and rails; airports, seaports, tunnels and bridges; health and education facilities etc. Based in UK, Balfour Beatty group has four leading market businesses and operates in more than 80 countries worldwide. Key challenge: To prepare a customized Safe PST Backup configuration file that provides software activation in offline mode. The custom configuration file of Safe PST Backup tool has been successfully developed with ability to activate the software on a hundreds of workstations in offline mode.